While there is no pivotal plot moment in Saga #40, the issue features interesting character development for a number of key players. There is also a significant return of a group whom we haven’t seen in quite some time. Saga has been so good for so long (relative to comic series), that it needs to reinvent itself from time to time to prevent becoming stale. In some ways, there has been stability in the story in the last few issues, but there are indications that writer Brian K. Vaughan and artist Fiona Staples may have some major changes in store for the war between Landfall and Wreath, which has raged since the start of Saga. Saga #40 opens with Robot IV having a guilt-ridden dream, which includes confessions to his son Squire, a conversation with the now totally-dead spirit Izabel and visions of war atrocities he committed. Meanwhile, Hazel watches Robot dream. Hazel realizes that she is going to be asked to do much more without Izabel, especially in caring for her unborn sibling. She really dislikes this idea. Nearby, Marko confesses that he is on edge because Phang is where he first killed during the war. Rather than being shattered by it, he admits that holding a weapon felt good to him, almost too good. The issue ends with Robot confronting Alana. Robot has taken some powerful drugs and his guilt over being a terrible father (and terrible overall) seem too much for him. Saga #40 ends with Robot telling Alana to care for Squire and pointing his hand-cannon to his head. The cliffhanger is the most important plot moment in Saga #40. I suspect that Robot will not fire. For one, Vaughan and Staples just killed Izabel. The series risks becoming desperate by offing too many characters. Also, if it was going to happen, the impact/shock would be more effective as the cliffhanger rather than starting the next issue. The other character development that occurs in Saga #40 is with Marko. His revulsion and attraction towards violence has been a fascinating element under the surface of the stories. Marko here speaks about his feelings on violence in the most direct way yet. I think Vaughan and Staples are building towards something with Marko here, and it seems like it could be a pivotal moment for the character. Speaking of building, another major plot moment occurs during a scene with Gwendolyn and the Lying Cat. 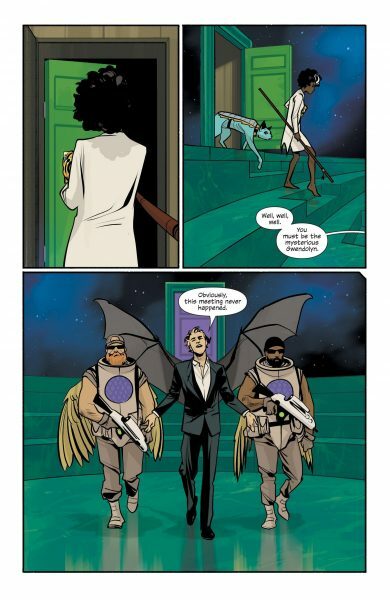 Gwendolyn has been absent from Saga since its last time jump and we only saw the Lying Cat briefly. 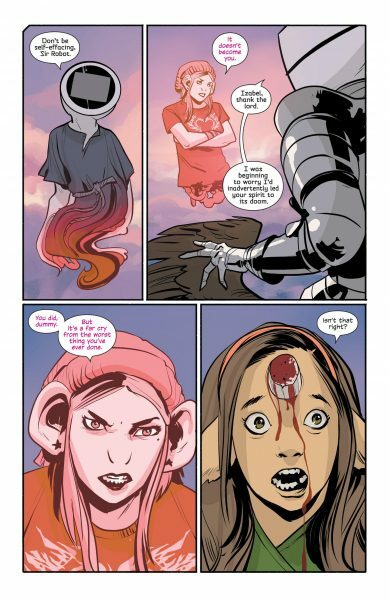 Gwendolyn is also with Sophie, so that’s three characters rarely seen in recent issues who pop up in Saga #40. Hopefully, that means they will be back again soon. However, Gwendolyn’s scene is loaded with implications. She delivers some sort of package to an emissary from Wreath. He implies that Landfall and Wreath may be looking to end their war, or at least a large portion of the fighting. This could be a game-changing moment for Saga. Marko and Alana’s problems have stemmed from them being from waring races. What happens if that war is over? On the art front, Staples does more excellent work. As the issue is based primarily around character moments, it’s not her more difficult or dazzling issue. Still, she handles these crucial scenes well. Her dream sequences for Robot IV was effective and dizzying. I have always found it impressive the way that Staples is able to portray the Robot race. I mean, they have TVs for heads, so there are no faces to emote. Still, She is able to consistently get across the way the Robot characters are feeling through a pithy image on their screens or body language. Saga #40 offers some good moments for both Marko and Robot IV. The return of Gwendolyn, Sophie and the Lying Cat is welcome. On the surface, there is not too much development of story threads. However, the negotiations between Landfall and Wreath suggest that some major changes in the universe of Saga could be coming. I don’t think it would be as simple as a ceasefire. Still, Vaughan and Staples seem to realize that their series needs to always have significant changes. 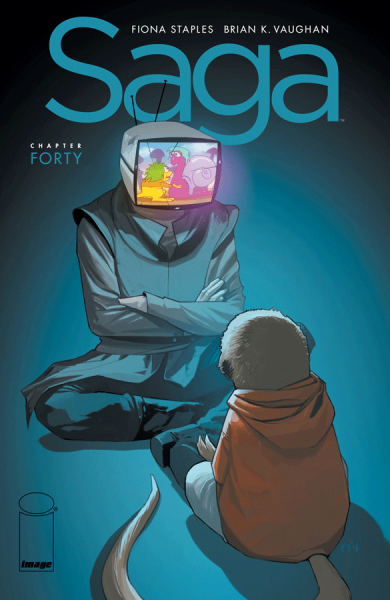 Although Saga #40 does not provide those moments, it seems to be setting them up for the near future.